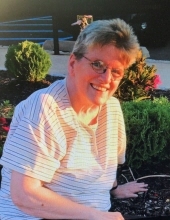 Cecilia Stricker, 70, of Jersey City, NJ, passed away peacefully on Tuesday, October 16, 2018 at her home. She was born and raised in Jersey City and has resided there her whole life. Cecilia was an avid reader. She was always fond of playing games on the computer, as well as keeping in touch with family and friends via various social media sites. She devoted herself to her mother’s care for the last 37 years. Cecilia is preceded in death by her beloved parents, Doris and Fredrick Stricker; and her sister, Carol De Rosa. Surviving are her dear brother, John and wife Gale Stricker of Bridgewater, NJ; her loving sister, Teresa and husband Mike Pompeo of Barnegat, NJ; her loving son Fredrick Stricker of Toms River, NJ; and her dear husband, Cyril Molony. Funeral services are private under the direction of the Branchburg Funeral Home 910 US Highway 202 South, Branchburg, NJ 08876. To send flowers or a remembrance gift to the family of Cecilia Stricker, please visit our Tribute Store. "Email Address" would like to share the life celebration of Cecilia Stricker. Click on the "link" to go to share a favorite memory or leave a condolence message for the family.